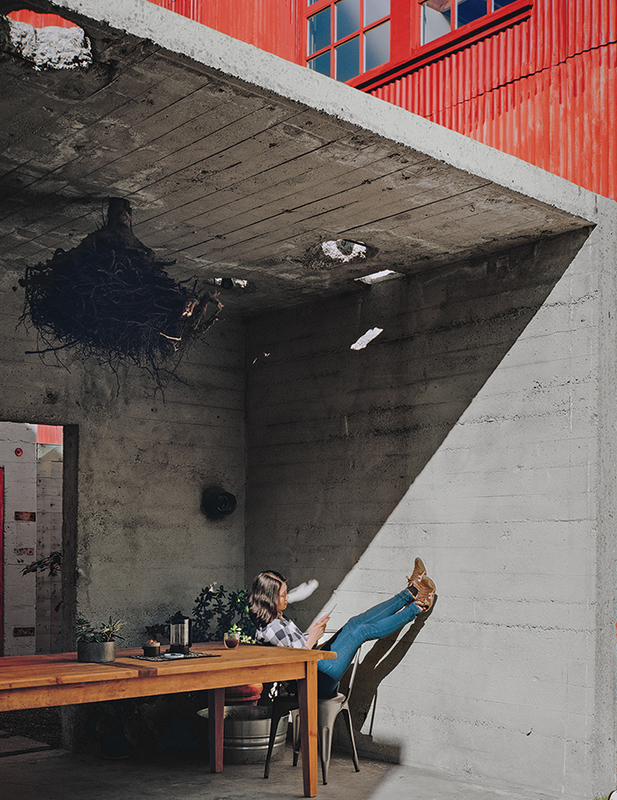 Kiyoko Loh relaxes inside a concrete structure, one of three original buildings that occupied the San Francisco property she and her husband, Elliot Loh, purchased in 2012. Working with architect Todd Davis, the couple decided to cut the bunker-like edifice in half and use it as an outdoor dining area that opens to a courtyard. The property is comprised of a succession of buildings that extend from the street-facing entrance. The 1,215-square-foot main house is the last of the three. The kitchen features custom casework by Peter Doolittle, dark-green slate countertops from Hamilton-Schwarzhoff, and a Heath Ceramics backsplash. In the living room, a Dublexo sofa and ottoman by Innovation Living was sourced from Zinc Details. The rug is from Ikea; the Kozy Heat gas fireplace is clad in gray tilework and knotty cedar planks. The clocks are from Muji and the posters are from Paper Jam Press. The couple’s bedroom, occupying a space that was once a machine shop, has a cedar sleeping platform designed and built by Elliot Loh. The built-in storage holds 30 pairs of Kiyoko’s shoes. French doors from Bonelli Windows & Doors were installed to satisfy a fire code that called for an aperture in the room. “Our lot is zoned more like industrial,” says Elliot. “We can build tall, up to 50 feet. It’s a good investment property.” The couple worked closely with the contractor, Dan Matarozzi, whom Elliot had worked with on another project. It was he who suggested architect Todd Davis. The front entrance is located next to the garage. Once inside the property, a cedar-clad walkway runs parallel to the open concrete pavilion. The couple uses the pavilion for outdoor dining. From there, the property opens to a small courtyard, and finally culminates at the main house, which holds one bedroom, a kitchen, a living-dining space, and a “flex” room. It’s a rainy November morning, and architect Todd Davis is sitting in his San Francisco office reflecting on his relationship with client Elliot Loh. Elliot is a 41-year-old software designer with a penchant for real-world building; in 2012, with dreams of proposing to his girlfriend, Kiyoko, on his mind, he hired Davis to turn a trio of abandoned structures in the city’s Mission District into a home for his future family. Elliot, with a career’s worth of design experience behind him, was eager to help create the ultimate product—the home he’d share with Kiyoko. Davis, who runs a one-man practice, relishes clients with ideas of their own. Together, their task was to transform an evocative but dilapidated property in time to host the couple’s February 2014 wedding party. Today, the property has a lush courtyard lawn, ensconced in clean planes of concrete, corrugated metal, knotty cedar, and sky. The home is now a secluded haven; when the couple first saw it, two years ago, it was anything but. “It was all concrete. It didn’t feel like a house,” says Kiyoko, an online content creator, who grew up in Thailand and Japan. “It was gray, gray, gray,” says Elliot, withdrawing from his pocket a fragile, finger-length model of the original property that he fabricated using a 3-D printer. The tiny stick of plastic shows three cubes lined up on a deep, narrow lot. Surrounded by a mixture of Victorians and light-industry warehouses, the hundred-plus-year-old structures have housed dry cleaners, an ammunition depot, a recording studio, and a boutique. Elliot and Kiyoko had spent most of their house search touring cookie-cutter condos; despite the property’s rough surface, they were immediately drawn to its potential. Using the sketching app Paper, the couple began trading ideas with Davis for an ambitious remodel. They’d tear down the rear structure to create a garden and build a large new residence on top of the existing buildings. They even picked the color scheme. “We thought it was all figured out,” Elliot says—until the contractor came back with an estimate way beyond their budget. Davis encouraged them to rethink their approach. Rather than tearing down and rebuilding, why not simply edit what was already there? The property had existing skylights, tactile raw materials, and just enough room for the couple to start a life together. “Todd told us that you don’t need to do it all at once. Build what you need now, save up, get to a different point in life, then build for that,” Elliot recalls. They decided to leave the first cube—a garage—nearly as is but cut the second cube in half, creating an amphitheater-like dining area plus room for a lawn (one of Kiyoko’s non-negotiable requests). The third cube was used as a residence in the past, so they’d simply refurbish it with new drywall and flooring; high-end appliances; and windows, doors, and tiles from local manufacturers. Red cedar planks, added inside and out, would tie the three structures together. Leaving the main structures intact and shopping for building materials online helped keep costs down. For now, the 1,215-square-foot, one-bedroom home comfortably meets the couple’s needs. As their budget and family grow in the next few years, they’ll likely adapt their original plan to add bedrooms over the garage. “We went from a sky’s-the-limit design to a less-is-more approach that was more about preserving the history of this mysterious building,” Elliot explains. In a city that’s changing at a pace many of its residents find unsettling, that is perhaps the most valuable design principle of all.